I am a member of the Etsy street team, called the "Trans Canada Etsy Team" and we are a group of artisans, spread across Canada, who all sell our work on Etsy. We work as a group to help promote each other, for example, we have collaborative advertising efforts and cross-promotions by including other team members' business cards in packages mailed to our customers. Socially we have done things such as secret Santa gifts during the holidays and we may do trades or supply swapping as well. It is a very supportive group and the active members see many benefits. I mention this, because, as you can see from that badge on the side of my blog, there is a "Trans Canada Road Trip" happening right now, which is a collaborative promotion that our team has put together. There are over 20 Etsy shops participating, including mine. All the shops are giving out ballots into a draw for two really amazing prizes. The promotion runs until July 1st, so this is our way of celebrating Canada Day! First of all, there is a gorgeous handwoven rag rug to be won. Who wouldn't want to win this?? (This rug is valued at $240.) To make it even more special, each of the participating members provided the raw materials to make it! It is made from t-shirts! 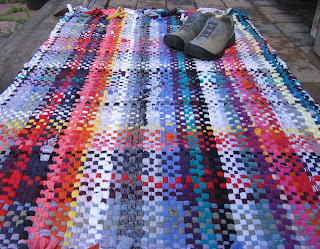 All our participating members sent t-shirts to Fiveforty and she used the t-shirts to create this rug. It is stunning, and it is big, measuring 34"x55"! 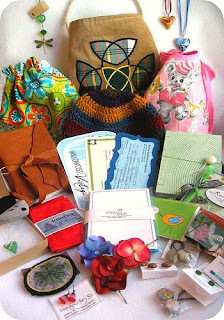 Also to be won, is a Grand Prize package containing handmade items from all the participating shops. This package of goodies is valued at over $350! And we are just giving it away!! So by now you must be wondering how you can get your name into the draw for this stuff?? It's pretty simple. Go visit the participating shops. And for every $10 you spend in those shops, you'll get a ballot into the draw. So, that's one ballot for any purchase that is $10 or less. But then additional ballots if you spend more. And when you make your purchase, if you mention the promo code "Road Trip" in your message to the seller, we will give you an extra ballot! It's never too soon to start your holiday shopping... especially if it gives you a chance to win one of those totally amazing prizes. Of course there are also lots of things in these shops that you might want to buy for yourself anyway... soap? We all need soap. How about some cranberry jelly, mmmmm. Reuseable food storage bags? They are better than plastic. Baby gifts? There will always be more babies who need stuff. Maybe you like to have a few birthday cards on hand? Maybe you need a leather journal?! Have fun shopping. And check out the full contest details on the TCET blog. Also on the team blog we are introducing our members from East coast to West coast as we make our virtual road trip across the country. Yesterday we visited a couple of places in Nova Scotia, and today we got as far as Moncton, New Brunswick. We'll keep going until we reach Vancouver on July 1st. Can you give us a clue as to which provinces all these shops are hailing from?